Judith S ilverthorne produced this 25 minute documentary in 1998 through her production company Spiral Communications Inc. Broadcast on CBC, Vision TV and Bravo. Enter the eclectic world of Roger Ing, a prolific Canadian artist, philanthropist, and former owner/operator of the New Utopia Café in Regina, a place where magical moments happened and a legend was created. Roger Ing’s Utopia, nominated for Best Documentary and for Original Music Score for Showcase 1998; Rupchan: Spirit of a Prairie Potter, Documentary-Drama for television was nominated for the Saskatchewan Film & Video Showcase Awards for best music in 1992. Roger Ing’s Utopia, a half hour documentary on Saskatchewan artist, Roger Ing and the phenomena of his Utopia Café (1998).Produced for SCN, CBC, Vision TV, and Knowledge Network, with funding from SaskFILM, the National Film Board of Canada. Judith co-curated the Roger Ing Exhibition, at the SCES Club Gallery, April 1998, in conjunction with the filming of Roger Ing’s Utopia. 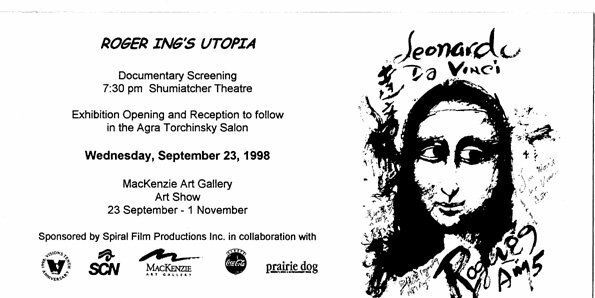 Screening, Exhibition, and Reception, Roger Ing’s Utopia, The MacKenzie Art Gallery, September 23, 1998. Immigrating to Saskatchewan from rural China in 1950, Roger brought with him early training in classical Chinese painting.His love of art continued in his new country as he embraced all kinds of new traditions and made them his own, while operating his restaurant for a living.Over the years, his paintings took over the restaurant, including the kitchen, eventually resulting in closure of the restaurant by the City Health Department. Artists such as Joe Fafard, Arthur McKay, Edward Poitras and Jack Severson share their memories of the New Utopia, called by many “the most important cultural institution in the city,” intercut with footage of Roger at work, painting and cooking. In September 1998, the Mackenzie Art Gallery in Regina recognized and celebrated Roger Ing’s large body of work with a major retrospective exhibition. Roger Ing was born in a small village outside of Guangzhou, China in 1933. He immigrated to Canada in 1950, first working in his father’s restaurant in Regina. Later, he and his wife, Mei, opened the New Utopia Cafe where Ing did the majority of his artwork. In his formative years, Ing learned the traditional bamboo brush painting style of art, which influenced much of his work. In Canada he immersed himself in painting and studying with Ken Lochhead, one of the Regina Five artists, who introduced him to Abstract Expressionism. Ing developed his own style referring to it as “Rogerism” or “Roger Style.” Studio, gallery, restaurant: the New Utopia Cafe was one and the same for Ing for 23 years. When he wasn’t out front serving customers, he was in the back creating new Rogerisms of his favourite subjects: tigers, dancers, sunflowers, birds, nudes, Frankensteins, or Mona Lisas. When his restaurant was closed because of health code issues in the summer of 1993, he continued to work at home. Over the years Ing had many exhibitions, including as a contributor of a Saskatchewan Arts Board show at the MacKenzie Gallery in 1962, as well as having solo exhibitions at The Bridge Gallery in 1993, Regina’s Albert Library in 1988 and 1989, plus several in the Saskatchewan Cultural Exchange Society Club Gallery in 1988, 1992, and 1996. 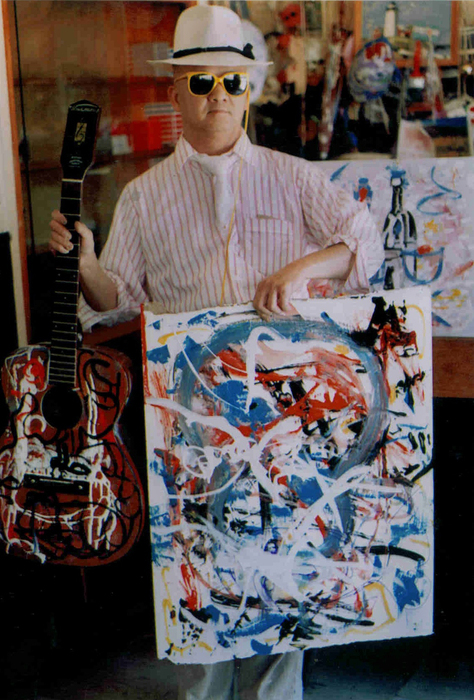 In 1998 Ing had his first solo exhibition in a major gallery at the MacKenzie Art Gallery, in conjunction with a screening of a documentary Roger Ing’s Utopia about him and his work. NB: Although the production company is no longer active, Judith is still enthusiastically involved with film and video production aspects of her career.